Dinosaur Comics - February 1st, 2016 - awesome fun times! –Then later on she died anyway, because death WILL inevitably claim us all!! February 1st, 2016: YOU GUYS, I started Dinosaur Comics on February 1st 2003, 13 years ago today! AS OF TODAY DINOSAUR COMICS IS OFFICIALLY A TEENAGER! This is madness. This is pure, freebased madness. Thank you all for liking my comics, for supporting it through merchandise and patronage throughout the years, and for letting me have the best job in the world! Holy crap. Y'all are the best. I can't believe I have a teenager now. 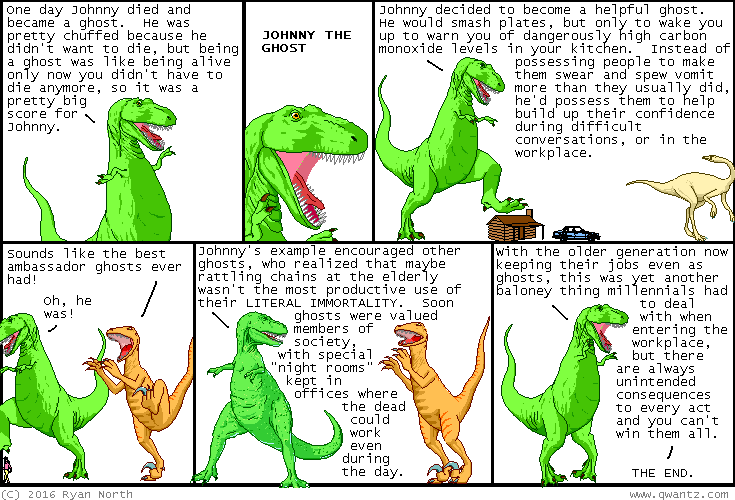 Dinosaur Comics is all sassing authority figures and sneaking into R-rated movies! Metaphorically! !